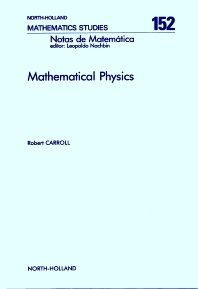 An introduction to the important areas of mathematical physics, this volume starts with basic ideas and proceeds (sometimes rapidly) to a more sophisticated level, often to the context of current research. All of the necessary functional analysis and differential geometry is included, along with basic calculus of variations and partial differential equations (linear and nonlinear). An introduction to classical and quantum mechanics is given with topics in Feynman integrals, gauge fields, geometric quantization, attractors for PDE, Ginzburg-Landau Equations in superconductivity, Navier-Stokes equations, soliton theory, inverse problems and ill-posed problems, scattering theory, convex analysis, variational inequalities, nonlinear semigroups, etc. Contents: 1. Classical Ideas and Problems. Introduction. Some Preliminary Variational Ideas. Various Differential Equations and Their Origins. Linear Second Order PDE. Further Topics in the Calculus of Variations. Spectral Theory for Ordinary Differential Operators, Transmutation, and Inverse Problems. Introduction to Classical Mechanics. Introduction to Quantum Mechanics. Weak Problems in PDE. Some Nonlinear PDE. Ill-Posed Problems and Regularization. 2. Scattering Theory and Solitons. Introduction. Scattering Theory I (Operator Theory). Scattering Theory II (3-D). Scattering Theory III (A Medley of Themes). Scattering Theory IV (Spectral Methods in 3-D). Systems and Half Line Problems. Relations between Potentials and Spectral Data. Introduction to Soliton Theory. Solitons via AKNS Systems. Soliton Theory (Hamiltonian Structure). Some Topics in Integrable Systems. 3. Some Nonlinear Analysis: Some Geometric Formalism. Introduction. Nonlinear Analysis. Monotone Operators. Topological Methods. Convex Analysis. Nonlinear Semigroups and Monotone Sets. Variational Inequalities. Quantum Field Theory. Gauge Fields (Physics). Gauge Fields (Mathematics) and Geometric Quantization. Appendices: Introduction to Linear Functional Analysis. Selected Topics in Functional Analysis. Introduction to Differential Geometry. References. Index.